FileZilla is a powerful FTP client that will assist the user to send files to a server. It offers a free and easy to use client that will enable both beginners and experienced users to connect remotely to a server in order to download files. This powerful application supports drag and drop, SSL and SSH protocols and allows to resume updates and interrupted downloads including Sizeable files (over 4GB). Thanks to manager integrated sites, the user can access addresses to which he connects a regular basis more quickly. FileZilla include interesting features, including the display of the amount of data transferred and the transfer time in the log window. FileZilla also provides faster access to the function of speed limit transfers and adds support for backspace button on the mouse that feature. The software has an interface divided into several areas, which gives an overview of current operations with more detailed information. 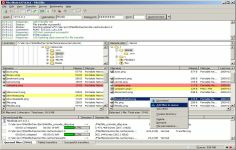 The user can set various options related to the connection to the server and software behavior during transfers. The transfer rate may, for example, be limited to save bandwidth. The use of a proxy is also possible.